The maximum deflection of a fully loaded residential floor allowed by most modern building codes is L/360. In this formula, L is the span of the joists and 360 is a factor that’s been determined to result in the maximum acceptable deflection. For example, if floor joists span 14 ft., or 168 in., the most that floor would be allowed to deflect when fully loaded would be 15/32 in. (168 in./360 = 16/32 in.). often L/480 or L/720. An L/720 floor would deflect only half what an L/360 floor does and would be far less bouncy to walk on. There’s little consensus within the wood flooring industry on floor stiffness, but it’s safe to say that installing wood flooring on a bouncy subfloor can result in squeaks and finish damage, especially on prefinished products. Some experts say the deflection should be no more than L/360 for floor spans up to 15 ft. and no more than L/480 for greater spans. In any case, most designs limit the actual deflection to V2 in. It’s tough to field-test for deflection, but you may be able to find the design deflection on the building plans. Generally, if a floor feels bouncy when I walk across it, I discuss stiffening it with the owner. Installing the floor may actually improve the system’s overall performance. However, if you do proceed, it’s smart to make the owner aware in writing of the potential problems. All parts of a floor have to work together for it to function properly. Posts should be spaced so the main beam is not over spanned. Joists need to be deep enough to support their loads without bouncing excessively, and the subflooring must be thick enough to span between the joists without sagging. Mid-span bridging helps to minimize joist flexing. Finish flooring usually runs perpendicular to the joists for better support. Floors need to be both, but with the materials used in most construction, it’s safe to assume that if the floor is stiff enough, it’s also strong enough. 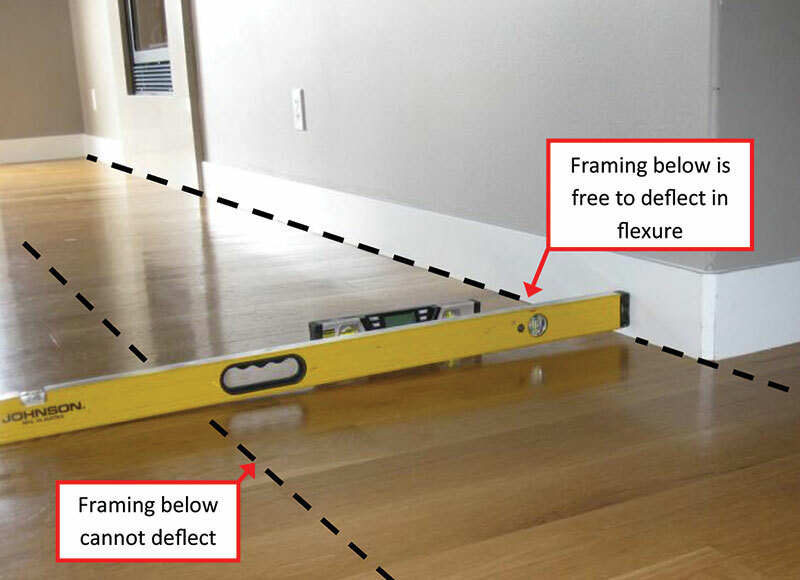 Stiffness is measured by the floor’s deflection under load. The standard load designed for most residential floors to support is 50 lb. per sq. ft. Of that, 10 lb. or 12 lb. per sq. ft. is assumed to be the dead load, or the weight of the building materials themselves, and 40 lb. per sq. ft. is the live load, or the weight of the furniture, people, and pets the floor will support. Commercial and public building floors are designed to carry greater loads. And, of course, we’ve all experienced old houses whose floors were visibly sagging, and which bounced when walked on. These floors either have been weakened with time, or were inadequately designed from the start. If you find a floor that deflects more than the standards given in the sidebar on the facing page, or that comes very close, there are several things you can do. You might be able to beef it up using one of the methods. Keep in mind that without having an engineer design the fix, you won’t be able to predict the exact effect of the reinforcement.